Two years ago when the West Quay wall collapsed, the West Quay action group, formed by residents and traders from the stricken waterfront, made the case for Pedestrianisation in order to give the area a new lease of life upon completion of the repairs works. 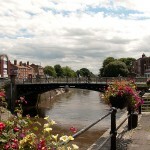 The Town, District and County councils backed this, being in line with their own ‘Bridgwater Vision’ plans. Now with a completion date given as the 23rd October it was high time for the movers and shakers of the local Authorities to sit down and face the people who have suffered from the catastrophe for these past 2 years and to get some answers to last minute questions. A meeting held on Tuesday 1st October, facilitated by Westover Ward councillors Brian Smedley and Kathy Pearce and hosted at Homecastle House, situated on the junction of West Quay and Chandos Street, included representatives from all the authorities. 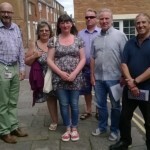 Alison Griffin (SDC Corporate director), Steve Gooding (SCC engineer), Tom Dougal (SDC Transport Officer) and Bridgwater Town Council Clerk Alan Hurford were joined by some 30 residents and traders. Future options for On-Street Trading in West Quay. Alison Griffin admitted that the partial pedestrianisation wasn’t what was originally planned in the Bridgwater Vision or what the West Quay Action Group had preferred but it was at least some way there and the new zone could be a big boost to the town. Steve Gooding said that the completion date would be 23rd October. His own involvement had only been since March 2013 and all the orders and plans were in place when he assumed his role. He stressed that the closure of West Quay would apply to Motor Vehicles-but not ‘vehicles’ and was especially worded so to allow Cycles. He also pointed out that loading and deliveries would be permitted between 6 and 10am. Brian Smedley said many people were concerned at the potential clash between cyclists and pedestrians if a possible cycle path was included along West Quay and similarly between cyclists and traders and asked whether this was an inevitable fixture. Steve Gooding said that the aim of a cycle path was to take advantage of the money granted through the Bridgwater Way project which would take cyclists along the riverside and at least it needed a ‘slip road’ effect to direct cyclists onto the West Quay route. He stated it was National and local policy to encourage and facilitate people to cycle. Tom Dougal pointed out that cyclists could cycle there anyway and that the street had previously been a signed cycle route for some 10 years. People present were concerned at the accidents waiting to happen and were even more so when the current SCC plan suggested that the cycle lane could be between shop fronts and the roadway which would suggest any future tables and chairs would be separated from the shops by potential cycle hazards. It was suggested that a ‘cyclists dismount’sign could be included. Steve Gooding correctly gauged the mood of the meeting was either to divert a cycle path to the opposite bank of the river or to channel such a cycle lane along the riverside of West Quay. Whilst he pointed out that this option was contrary to left hand drive British road traffic regs, several people pointed out exceptions to that rule including locally. He also said that he felt a ‘cyclist dismount’ sign would be ignored. 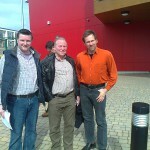 Cllr Smedley presented a petition to Steve Gooding from residents which objected to the proposal to retain the two way traffic flow option along the Northern section of West Quay. People were concerned that the roadway was not wide enough to include this option and a one way system from the Castle street area exiting through the Northgate Car park should be implemented instead. Steve Gooding was adamant that as the original road was 2-way then to change it back would require not only additional Traffic Orders but would be a better option as there would be a kind of natural throughflow as motorists waited at wider road sections to let others through. This didn’t come across as too convincing to the majority present who were not happy at the prospect of the Castle street Heritage zone becoming an increased route for traffic when the aim was to limit this. It was further hotly debated as to whether residents had been kept informed as to the plans, some suggesting that the former head of works from SCC, Peter Radford, had clearly said the through-route would be one-way as two-way would be ‘unworkable’. It was also noted that the original West Quay two way section was a dead end and largely used for parking with most vehicles simply reversing away from it. Alison Griffin was asked about plans for making the Quayside more attractive, whether there would be Council support for traders and how on-street trading would work. She said there was a limited amount of financial support available to help traders enhance their shop fronts and urged people who wished to extend their trade outdoors to approach County with their licence bids to do so. She said SDC would support bids for on street trading. Steve Gooding drew attention to the need for Emergency vehicle access and therefore to designate an adequate portion of the road to facilitate that. It was also pointed out that the key point of pedestrianisation was to bring more pedestrians to the area to use the shops and that there had to be allowance for ease of access and attractiveness to do so. Carol Sharp, a West Quay resident, said it was also important to think about amenities for residents along the riverside . She was supported by another local resident, Lyndon Brett ,who pointed to an area of potential amenity which could be added to with possible seating. Cllr Smedley stressed that the meeting had no power to make any changes but asked the Corporate Director to sum up the options for the future. The routing of the cyclepath would be re-looked at in light of the comments made today. Moving towards an on street trading culture would be encouraged and traders should formulate clear licence aspirations and submit them as early as possible in the light of the imminent pedestrianisation. Whilst the two-way throughflow was enshrined in the Trafic Orders to date they need not be sacrosanct and could be re-looked at to take account of potential failings and a new TRO could be considered to reverse this should that be the case. Sedgemoor were committed to helping the traders recover their trade and the best means of doing this was to focus on enhancements for West Quay and that would include some element of financial support regarding shop frontage. 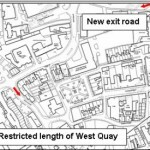 West Quay Pedestrianisation – Is It a One Way Street?